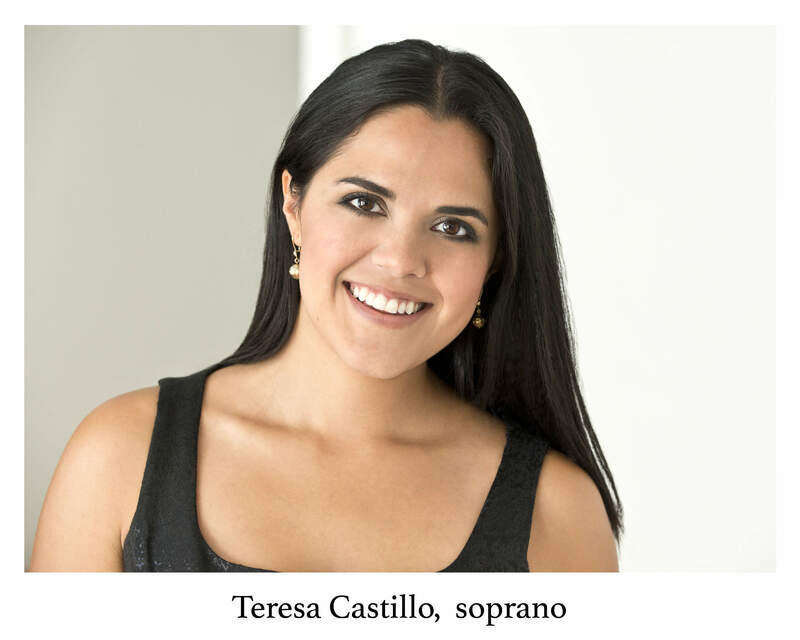 Hailed by the San Francisco Gate for her vocal “power and florid elegance”, soprano Teresa Castillo was a recent participant at San Francisco Opera’s prestigious Merola Opera Program and sang the role of #1 in Conrad Susa’sTransformations. Spring 2019, she made her Carnegie Hall debut appearing with the New England Symphonic Ensemble performing a brand new work entitled Reflections on a Mexican Garden, which was written for her by composer Kevin Padworski. January 2019, she made her debut with the Imperial Symphony Orchestra singing the role of Königin der Nacht in Die Zauberflöte.She is a recent first place winner of the Lois Alba Aria Competition, Anita Cerquetti International Opera Competition, semi-finalist in the prestigious Hans Gabor Belvedere competition, winner of the Elaine Malbin Competition, and career grant recipient from Career Bridges New York and the Anna Sosenko Trust. Ms. Castillo appeared at Bel Canto at Caramoor for two summers as an apprentice and young artist. While there, she covered the role of Adele in Il pirata and sang the Soprano Solo in Rossini’s Petite Messe Solennelle. She also sang in the U.S. Premiere of Terra Cotta Warriors in 3D. As an emerging artist with the Virginia Opera, she covered the roles of Lucia in Lucia di Lammermoor and Tytania in A Midsummer Night’s Dream and recently appeared in the Inaugural Season of Teatro Nuovo singing the role of Creusa inMedea in Corinto as a Resident Principal Artist under the direction of Will Crutchfield. Fall 2018, Ms. Castillo was featured in the Opera Theatre of St. Louis Opera on the GO! series as Rosina in the reduced version of The Barber of Seville. She will be making a role debut in 2019 as Chiang Ch’ing (Madame Mao) in Nixon in China and will be returning to Opera Theatre of St. Louis for their Opera Tastings series. Other recent performances include Yum-Yum in The Mikado with Loveland Opera Theatre, Barbarina in Le Nozze di Figaro with Emerald City Opera, Elsie Maynard in Yeomen of the Guard with Empire Lyric Players, The Dew Fairy inHansel and Gretel with Lamont Opera Theatre, Drusilla in L’incoronazione di Poppea with Metropolitan State Opera Ensemble, and Adele in The Bat with Rocky Mountain Chamber Opera. She was also a member of the Central City Opera Ensemble for seven seasons. On the concert stage, Ms. Castillo has performed Mahler’s Symphony No. 4, Brahm’s Ein deutsches Requiem and the world premiere Grammy-nominated composer Austin Wintory’s Convergence with the Boulder Symphony and Orff’s Carmina Burana with the Arapahoe Philharmonic. Along with her standard repertoire, she frequently enjoys singing new works by established and upcoming composers such as her performances as Ana Maria in the new opera En mis Palabras with the Central City Opera Ensemble. Ms. Castillo is represented by Robert Lombardo associates.